The Ghana Football Association (GFA) has confirmed that Frenchman Phillipe Troussier and former Rwanda coach Ratomir Dujkovic are in the running for the Black Stars job. GFA vice-chairman Kwesi Nyantekyi told BBC Sport the pair were two of the names Ghana was considering to take charge of the four-time African champions. The post became vacant after Portuguese coach Mariano Barreto quit in September to assume control of first division side Maritimo in his homeland. It is unclear whether Troussier has applied for the job, as he is currently known to be interested in taking charge of Wales. Nyantekyi confirmed that about forty coaches, mostly Europeans, had officially applied for the job but said the GFA has decided to widen its scope and look outside these applications. The GFA will compile a shortlist of up to five candidates by Friday and hopes to choose a new national coach through panel interviews by 15 November. Both Troussier and Dujkovic have a good knowledge of African football. 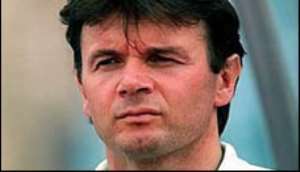 Troussier made his name in the Ivory Coast with local side ASEC Abidjan before going on to coach Nigeria and South Africa among other national sides. Dujkovic, meanwhile, masterminded one of the biggest upsets in Cup of Nations history when he guided Rwanda to Tunisia 2004 ahead of qualifying group rivals Ghana. It was the first time the East Africans had qualified for the competition, and Dujkovic led his side to its first victory in the finals with a 1-0 defeat of DR Congo in the group stages. The Serb coach left his post with Rwanda when his contract expired on 30 July. Ghana has had a chequered history with foreign coaches lately, and whoever is appointed in mid-November will be the fifth foreigner in charge of the Black Stars in the last two years.